That Time Jordan Anderson Sent His "Letter from a Freedman to His Old Master"
During the 19th century, there were many freed slaves that went on to lead extremely noteworthy lives despite all the adversity they faced in their lifetime, such as the world famous Frederick Douglass, who not only played an important role in fighting for black people’s rights, but also championed women’s rights, particularly playing an important part in the fight for the right for women to vote. Not everyone can be so accomplished as the great Frederick Douglas, but that doesn’t mean they don’t at times do noteworthy things. This brings us to the subject of today- one Jordan Anderson, a former slave who received a letter from his former master requesting he come back to work. Jordan’s reply was a deliciously satirical letter in which, when reading between the lines, he essentially told him in the most polite and eloquent way possible to kiss his derriere. Widely published throughout the United States and parts of Europe, the response made Jordan a media darling overnight. Given his background as a slave, we unsurprisingly know very little about Jordan’s life prior to being taken from his parents and sold as a boy. What little historians have managed to piece together is that Anderson was born in December of 1825 “somewhere” in Tennessee. In fact, we know so little about Jordan that we’re not even sure if that’s how he actually spelled his first name, since it’s written as “Jourdan” on some documents, such as an 1870 federal census of Dayton Ohio where he lived at the time, and “Jordan” on others. This said, historians are confident that Jordan was sold into slavery at around age 7 or 8 to one General Paulding Anderson. Anderson then took Jordan and gifted him to his son, Patrick, who went by his middle name, Henry, for most of his life. Exactly what role Jordan served during his formative years isn’t clear, but we do know that at the time it was common for slave owners to give their children similarly aged slaves to function as servants who doubled as playmates; so it’s likely Jordan served such a function for Henry who was around his age. As he grew into a man, Jordan took a more active role on the Anderson family plantation in Big Spring, Tennessee, apparently becoming one of Henry’s most reliable and able workers. At an unknown point in time in 1848 while working on the plantation, Jordan married a fellow slave named Amanda McGregor with whom he eventually sired 11 children. When the American Civil War began in 1861, Jordan’s life changed very little and he still continued to dutifully work the plantation for his master with his wife until one fateful day in 1864 when Union Soldiers happened upon the plantation. Upon encountering Jordan, the soldiers granted him, his wife and children their freedom, making the act official with papers from the Provost Marshal General of Nashville, documents Jordan would treasure for the rest of his life. Upon being granted his freedom, Jordan immediately left the plantation which angered Henry to such an extent that he shot at Jordan as he was leaving, only ceasing to fire when a neighbor grabbed Henry’s pistol from him. Reportedly, Henry vowed to kill Jordan if he ever set foot on his property again. Following his departure from the plantation, Jordan worked briefly in a Nashville field hospital, becoming close friends with a surgeon called Dr Clarke McDermont. When the Civil War ended in 1865, McDermont helped Jordan and his family move to Dayton, Ohio and put him in contact with his father-in-law, Valentine Winters, an abolitionist who helped him secure work in the town. Jordan’s quiet life was briefly shattered in July of 1865 when out of the blue he received an urgent letter from his former master, Henry. As Jordan couldn’t read, he took the letter to Valentine Winters and asked him to read it to him. As it turns out, following the Civil War, the Anderson Plantation had fallen into complete disrepair, as is wont to happen when your entire workforce leaves pretty much all at once. Deeply in debt, in a desperate attempt to save himself from total financial ruin, Henry reached out to the only man he knew who not only had the skills needed for the harvest, but also potentially the clout to convince some of the other slaves to return for paid work- Jordan Anderson. The letter also promised that Jordan would be paid and be treated as a free man if he returned. As to my freedom, which you say I can have, there is nothing to be gained on that score, as I got my free papers in 1864 from the Provost-Marshal-General of the Department of Nashville. Mandy says she would be afraid to go back without some proof that you were disposed to treat us justly and kindly; and we have concluded to test your sincerity by asking you to send us our wages for the time we served you. This will make us forget and forgive old scores, and rely on your justice and friendship in the future. I served you faithfully for thirty-two years, and Mandy twenty years. At twenty-five dollars a month for me, and two dollars a week for Mandy, our earnings would amount to eleven thousand six hundred and eighty dollars. (About $178,000 today) Add to this the interest for the time our wages have been kept back, and deduct what you paid for our clothing, and three doctor’s visits to me, and pulling a tooth for Mandy, and the balance will show what we are in justice entitled to. Please send the money by Adams’s Express, in care of V. Winters, Esq., Dayton, Ohio. If you fail to pay us for faithful labors in the past, we can have little faith in your promises in the future. We trust the good Maker has opened your eyes to the wrongs which you and your fathers have done to me and my fathers, in making us toil for you for generations without recompense. Here I draw my wages every Saturday night; but in Tennessee there was never any pay-day for the negroes any more than for the horses and cows. Surely there will be a day of reckoning for those who defraud the laborer of his hire. At Jordan’s behest, Winters sent the letter to Henry with the simple, informal title, “Letter from a Freedman to His Old Master”. Winters later had the letter published in an edition of the Cincinnati Commercial with the same title. The letter proved to be immensely popular, both because of the sheer level of snark displayed and the eloquence with which Jordan had told off his former “boss”. The letter was later reprinted in papers across the country and even published in parts of Europe, making Henry a world-renowned laughing stock. Unsurprisingly, Henry never took Jordan up on his offer to pay him 50 years of wages in one go and the letter likely stopped any of his other slaves being tempted back when he wrote to them as well. As a result, the crops that year were never harvested. Henry, deeply in debt, had to sell the plantation for a fraction of its worth and he died penniless and destitute a few years later at age 44. As for Jordan, he lived and worked in Dayton for the rest of his long life, dying at the age of 81 in 1907. How did ex-slave’s letter to master come to be? Scan of letter from period newspaper. Wow, can you call it a mic drop? I’m not sure whether or not they had microphones back then…. They sorta did. They were called megaphones. Thank you for this interesting account. I need to inform the author, however, that he made one serious blunder. (1) The word, “sired,” refers to an action performed by a male — not by a female and not by a male and female together. The grammatical construction of the sentence (due to the use of “with whom”) wrongly implies that Jordan and Mandy together “sired” eleven children. (2) The greater error, however, is the very use of the verb, “sire.” Nowadays, this verb is used almost exclusively to refer to the fathering of children by an animal — especially a stallion — not by a human being. It is a particularly grave gaffe to refer to a black man as having “sired” children, given the improper thinking (by Patrick Henry Anderson et al.) that Jordan was a subhuman being. I agree about the use of the term “sired.” It stands out, and not in a positive way, in an otherwise wonderful account. I agree. The word sire is entirely appropriate in its context and only offensive to those overly sensitive to the prerogatives of gender. Sire is male animal fathering baby animals… the use in this article is offensive. The man “fathered” 11 children. I agree that the choice in words here is unfortunate, and while there technically may be little grounds for actually taking offense, it wouldn’t take anything away from the article to change “sired” to “fathered”… only add, as a matter of fact. That was my immediate reaction on reading that. You totally focused on the letter’s grammar, fine but the stor[e]y is what is important. Any spelling errores to correct? Bravo!!!! That is why we have editors so that proper language is used. I did not like the use of the word “sire ” either. I hope I’m not being too trite and cliched if I suggest that when the film is made, this is a natural part for the aptly named Morgan Freeman to play! You have it backwards. Morgan Freeman already narrated and/or acted out this part, and history just rearranged itself to fit. Morgan Freeman Morgan Freeman. Morgan Freeman Morgan Freeman. There must be a copy of the original letter so where is it? Sounds as if this letter was dictated and written by a well educated person at the time using Jordan’s own feelings. Mr. Anderson was probably an illiterate man, since it was illegal to teach any slaves to read and write at all. And his former master doesn’t come across as someone kind and caring that would have allowed any education given to his slaves at all. At that time Ohio was a huge hub for the Underground Railroad and chances are that Jordan met some of those people and told his story or the wish to write a letter. Or maybe the idea was planted to him and from there any abolitionist would have written such a letter and use it for their cause. 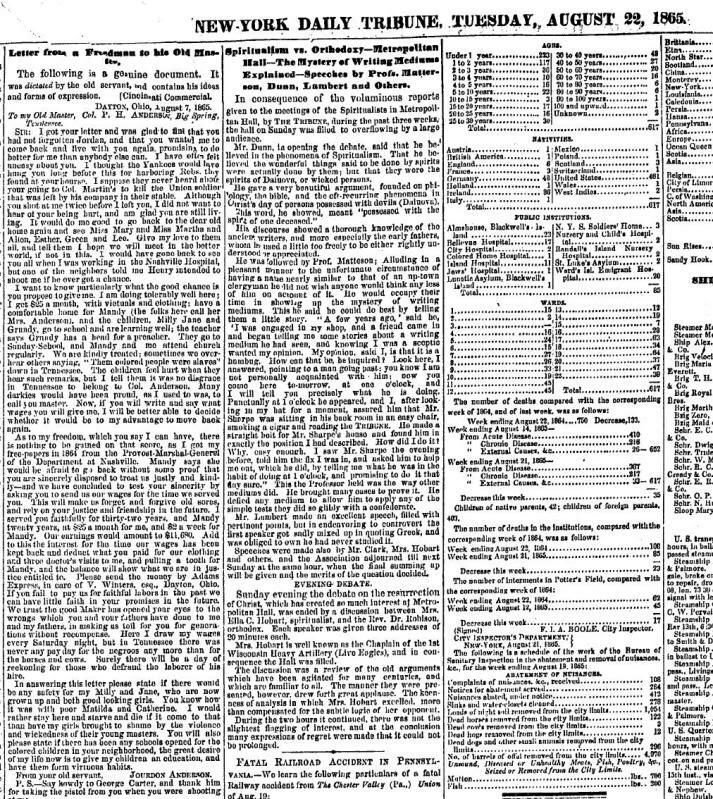 In fact the letter was written in early August 1868 and it was already on the newspaper less than three weeks later. So what was the real motive and who was helping whom? The article states that Jordan enlisted the help of an educated white man, an abolitionist friend who had originally helped him get work in that town, to write the letter. I would not be surprised if a bit of along-the-way editing took place, but that doesn’t mean it wasn’t Jordan’s letter. He told his story to his friend and gave all the reasons why he would not return, and his friend wrote it out in letter form. It’s already common knowledge that Jordan Anderson did not WRITE the letter himself in the most literal sense, because he WAS illiterate. He dictated it to his current (at the time) employer, Valentine Winters. And yes, it’s perfectly possible that Winters (who was an abolitionist activist) had his/her own motivations for doing this for Mr. Anderson, and may even have contributed a bit to the “editing” process. However, there’s no evidence to suggest that the message itself is fabricated, or that any part of it did not come out of Mr. Anderson’s own head. 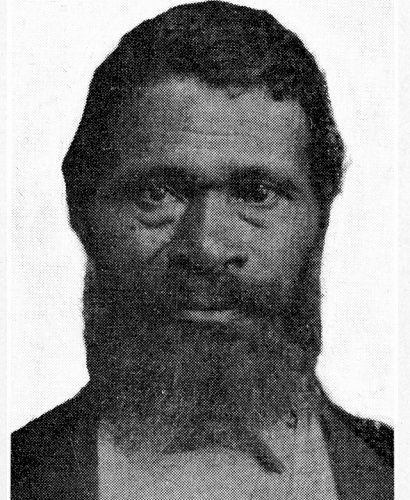 Especially given that many historians have researched the details mentioned in the letter, and too many of these details have been proven to be true for the story to have been invented by a random abolitionist (note Mr. Anderson was freed by Union soldiers, and did not meet activists until he was well out of Confederate/formerly Confederate territory, so they could not have had independent knowledge of these details unless Mr. Anderson had told them every irrelevant detail about his past life for no apparent reason). Not to mention, many people who grew up without access to schooling as children are often very articulate and intelligent AND completely illiterate. That is definitely not a contradiction in terms, especially in cases like Mr. Anderson where systemic injustice was the main reason they didn’t get an education. Woe betide those who underestimate the illiterate, for that’s the kind of arrogance that blinds one to one’s own downfall. Jordan Anderson would have shared his feelings with Valentine Winters who would have written the letter. Simple as that. A man with no education would definitely not think in the form the letter takes. From the background information, it sounds like Anderson was called back in part because he was known to be an intelligent man with the skills to help get the farm running – he wasn’t just a physical labourer, but probably had some management skills as well. It also seems like he spent much of his childhood with his ‘master’s’ own son, who would have been better educated. So although he never learned to read and write, there’s no reason to think he wasn’t an eloquent man verbally. It’s not that uncommon for groups of people without access to written language to get very into storytelling and debating and in fact to have very good skills in that area. I imagine there was some amount of collaboration with his more educated boss/scribe to get everything worded just right, and to get the language formal and correct enough, but I see no reason to assume it wasn’t mainly his own creation. “The letter proved to be immensely popular, both because of the sheer level of snark displayed and the eloquence with which Jordan had told off his former ‘boss'”. What snark? Is it snarky to state the truth? Jourdan never once adds “… but you too foolish to see this” or “… but I’m sue you won’t” to the end of any of his suggestions. That would have been snarky. $25 of 1865 dollars would be worth: $367.65 in 2015. That was Anderson’s salary. I don’t believe any of this, I need more proof. If you check the references, there is a scan of an article from the New York Daily Tribune which printed the letter. I suppose it could be fabricated but it looks like the genuine article to me. And for those debating whether Jordan was responsible for the letter’s content, refer to same Tribune article. Prior to the letter, it states: “The following is a genuine document. It was dictated by the old servant and contains his ideas and forms of expression.” That supports the view that the contents of the letter, certainly the ideas behind it belonged to Mr. Anderson. my Milly and Jane, who are now grown up, and both good-looking girls.